I definitely could have pulled up the grey/black more since it’s an evening look; I'm just shy about more dramatic makeup. 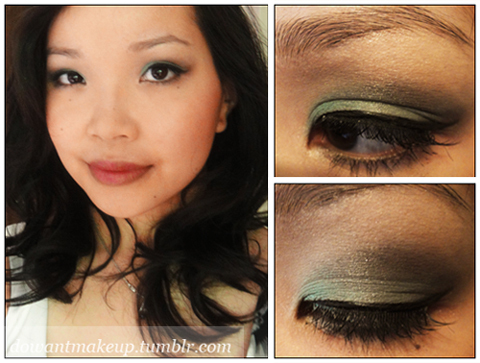 I love that false lashes, whether bold or natural, make such a huge difference to a look. Unfortunately I'm still terrible at putting them on! Peacock Lustre was really an impulse buy: Ulta had buy one get one 50% and the colour was just so pretty and unique to my current stash of shadows. 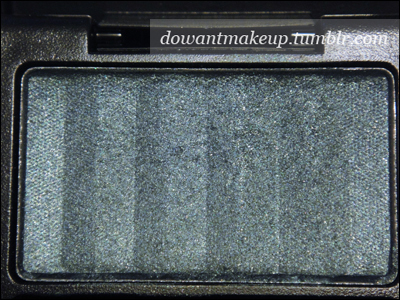 I don’t have a teal quite like this, since it leans more green than my other shadows. The base is a sort of foresty-green (I’m terrible at describing colours). The large window on the packaging is great at showing off the colour and catching your eye at the drugstore, but overall the black plastic case feels a bit flimsy and cheap; I wouldn’t suggest throwing this in your bag where it could get knocked around a lot. Not that it's especially important to me, but I don't really feel it’s “peacock” enough—the shimmeriness is right, but it needs to be either brighter or deeper (see: Joe Fresh Peacock nail polish). For its price range, it feels fairly soft and smooth. 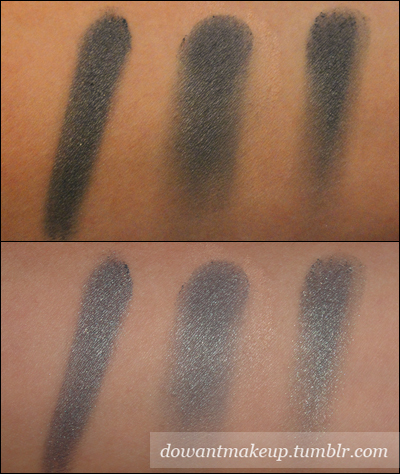 Swatching it over concealer gave the shadow a teeny bit more depth, although it’s kind of hard to tell in the picture. I wore it for several hours with zero creasing and didn’t notice much fading. My skin is normal/dry though, so I can’t say people with oilier lids will have the same results. 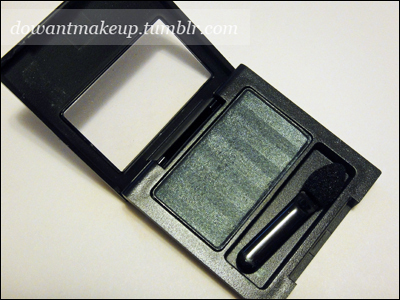 Overall, if you are looking for something to use as a sheer wash of colour on the lids, this could be a good buy. It takes some work to get the shade to be as dramatic on your eyes as it looks in the pan, but at least you get there (or close) eventually. I got this on sale for about $2.50 USD in Washington, but if I had bought it in Canada where it runs for about $8, I might have been a little peeved at the level of colour payoff. There are actually 24 shades in the Neutrals range, so here’s part one. 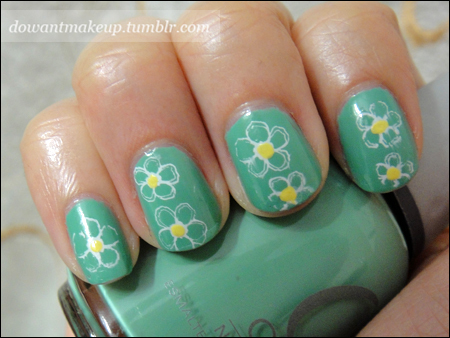 This time I took the swatch photos with flash on, which I think is a bit more accurate. 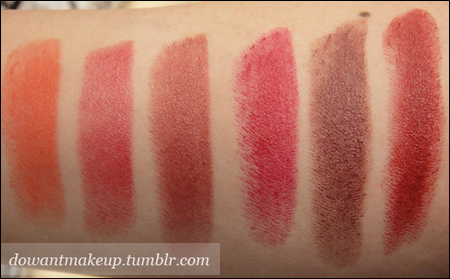 Random fun fact: my first blush ever was the Revlon blush with the rectangular pan in a shade called Sandalwood. And yes, I did use the tiny brush included. 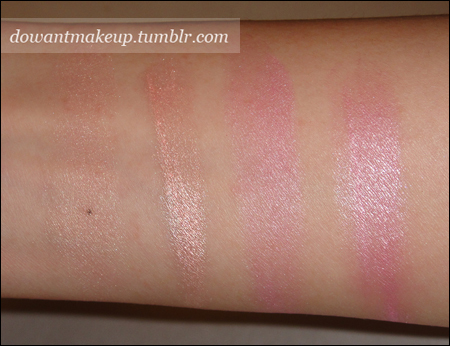 I unintentionally took this second photo with my arm at a different angle in relation to the lighting overhead so these swatches look like they have less of a shine than those in the first one. 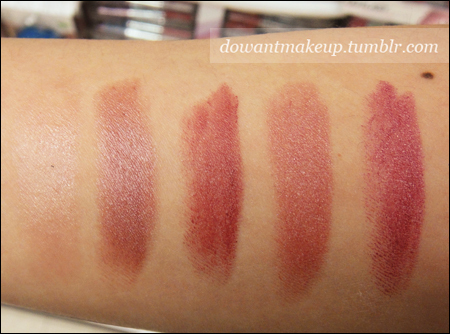 Again, a very pigmented shade range. Coralberry really sticks out, though. 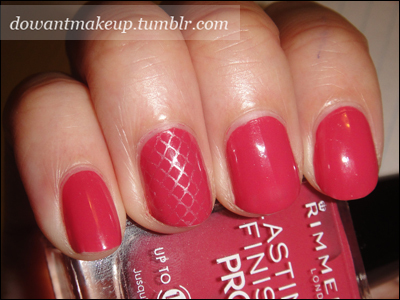 This bright pink is a lovely colour (especially for Spring!) but it doesn’t have brown tones to it like the others. I love the watery colours of this skirt. 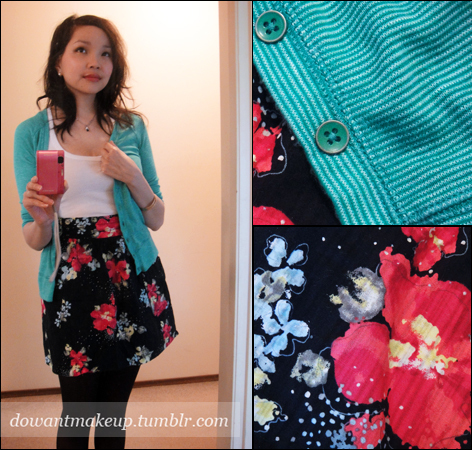 It's paired with leggings since it's still cold out :> The turquoise cardigan has a fine stripe that's not obvious unless looked at close up. I’m not sure why some of these colours have been classified as plums (as specified by the Revlon Super Lustrous display) or what makes a colour plum in a technical sense. 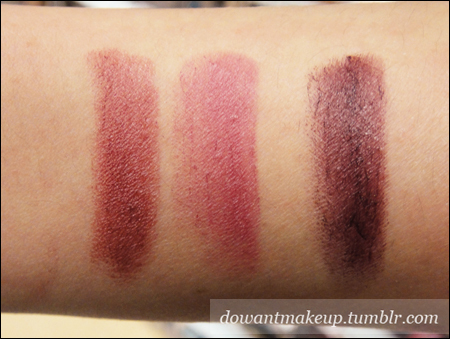 I’d call maybe the deeper half of this range plums, and the rest pink and red. Regardless of what shade family they belong to, there are quite a few lovely shades to be found here. Note: the photo above was taken on the top side of my arm rather than the underside--that's why the swatches don't look as smooth! 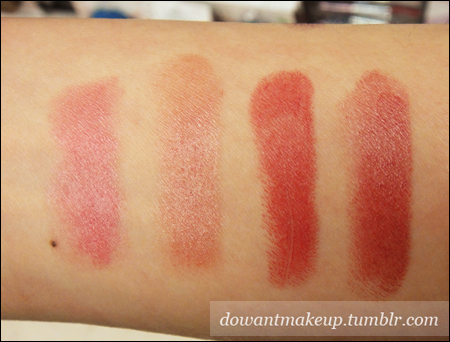 Most of the swatches here achieved great colour with 2-3 strokes. Berry Rich was beautiful after just one stroke. Don't be scared by the "reds" description! 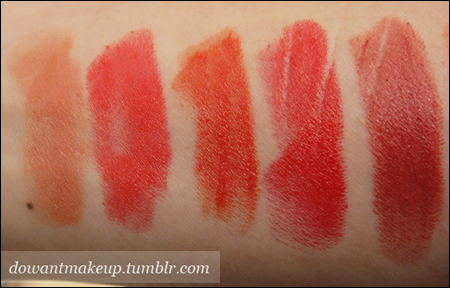 There's a nice variety in this family, from brights to more muted my-lips-but-better shades. No duds here. I was quite impressed with the pigmentation, and they applied very smoothly. 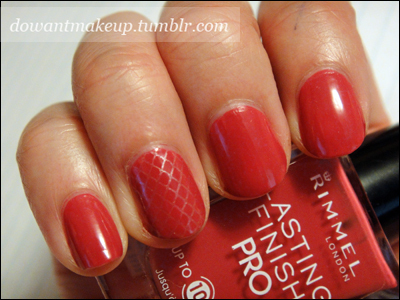 It was while swatching these shades that I fell for Wine With Everything, which I went on to love and review. It’s kind of strange that there are two Wine With Everything shades, but one is a frost/pearl (#520) and the other is the creme I own (#525). 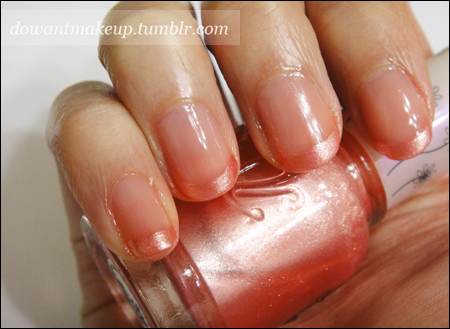 The creme is a deeper colour that doesn’t have as much pink. Although the Jackpot set is no longer available, all of the shades in the Jackpot set (except Whiskey) can be purchased individually as a full-sized pencil. 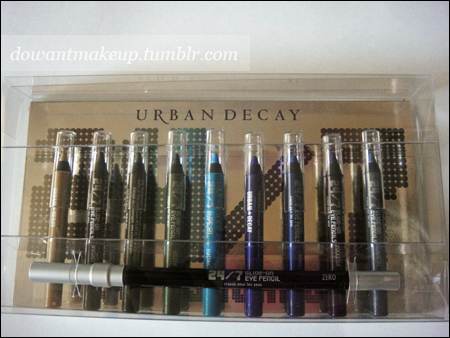 The 24/7 Glide-On eyeliner pencils are one of Urban Decay’s best-known and best-selling items, and I can certainly understand why. 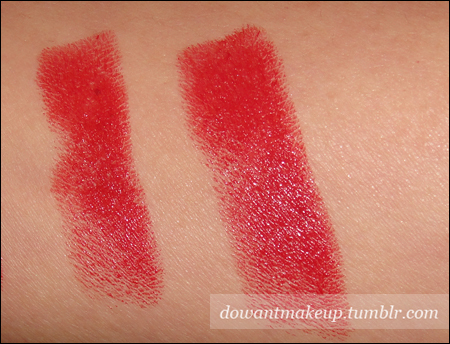 These liners truly “glide” when applying them in all their creamy and effortless awesomeness. 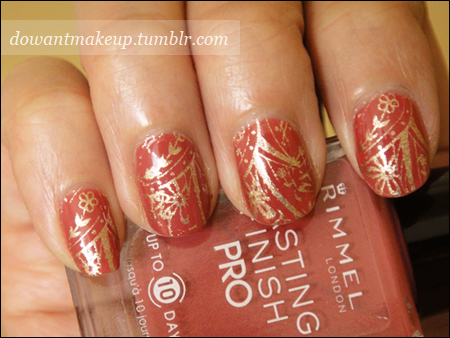 They impart lovely, pigmented colour with the tiniest amount of pressure. Although there are other eye products out there that feel lovely and creamy on application, 24/7 stands out because it sets on the eyelid quickly and does not crease or smudge (I'm looking at you, Rimmel Eye Glistener.) Their creaminess makes them easy to use for tightlining and lining the lower lashline, which can be especially painful and difficult with too-hard liner pencils, while staying put due to the waterproof formula. And I mean seriously waterproof. After taking pictures of the swatches on my arm, I tested rubbing them off my arm under a running tap for a while but they didn’t budge. I finally got them off with a combination of cleanser and eye makeup remover. 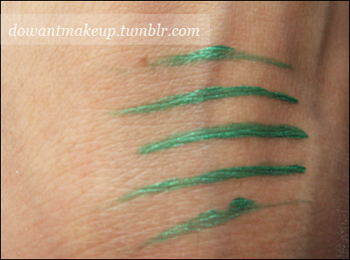 Sidenote: Annabelle Metallic Kohl eyeliner in Mojito is actually pretty close to Mildew shade-wise, but Mojito is just a bit warmer with more yellow in it. Eldorado, Mildew, Electric, Binge, Gunmetal, and Stash are the shades that have the most shimmery metallic look, whereas Rockstar, Whiskey, Ransom, and Zero have a more subtle shimmer or lean matte. This is a very versatile set because all kinds of looks are possible, from subtle neutrals to bright and fun colour. These pencils would be awesome for those that have difficulty drawing their eyeliner with a wing. Because 24/7 pencils are so creamy, I can draw a line on my upper lashline, then use an angled liner brush to go over the line and pull it out for a perfectly crisp wing. 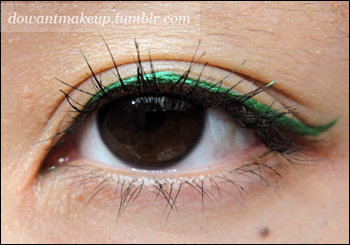 Much easier than winging your eyeliner with gel or liquid liner, which can be so finicky! All in all, this set was an amazing purchase: creamy, soft, smooth, and long-wearing pencils that worked out to be about $4 each—$3 if you consider the coupon I used. Sometimes value sets aren’t that great of a deal for me because there are shades or products in the set that I don’t like. This is definitely not the case here, as I love all of the shades included in the Jackpot set--although if I had to choose, my faves are Eldorado, Mildew, Zero, Rockstar, and Binge. 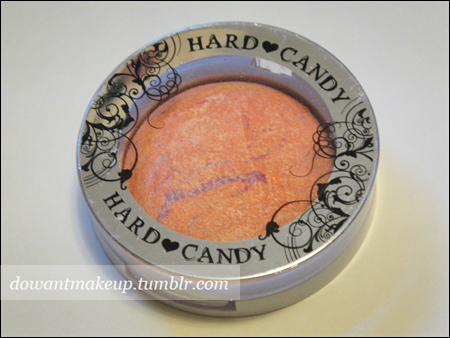 After trying and loving the gorgeousness that is Honeymoon, I couldn't help but snap up another Hard Candy baked blush. And I have to admit that it overtook Honeymoon's place in my heart. 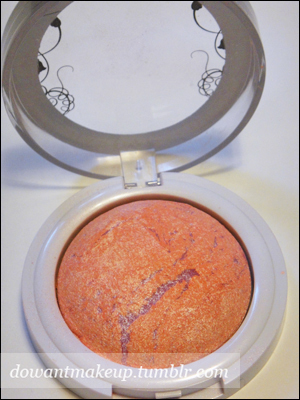 Hard Candy Blush Crush blushes come in sturdy clamshell packaging that belie its seriously affordable price. Since they’re baked, I also feel the blush inside is also less likely to crumble or break if you drop it. 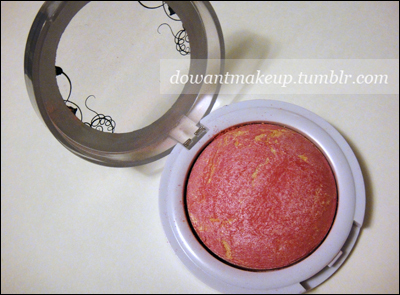 This picture is the one that most accurately captures the colour of this blush in the pan. It is a cooler-toned pink with butter-yellow veining. 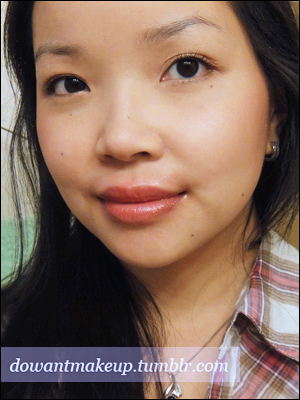 As with Honeymoon, this blush can be used wet for a more dramatic look. On the left is Honeymoon dry (it’s a little hard to see because of its paleness/subtlety) and wet, then Living Doll dry and wet. Using it wet intensifies the shimmer in the blush, while the dry is more wearable and the shimmer is subtle enough to wear in the office. You can really see the cool-toned pink of Living Doll here. It's the bright and fun sister of soft, sweet, and demure Honeymoon. The colour payoff on this blush is quite good: I just need to swirl my brush over it a bit and sweep it over my cheeks for an instant pretty flush. I love that I can put this blush on at 6:30am and still see it on my cheeks at 6:30pm. I've had this blush for over a year now, and I still reach for it all the time. I prefer it over Honeymoon especially in the winter when my face really needs some colour. If you've ever lurked your closest Wal-Mart's makeup aisles, I bet you've paused at the Hard Candy makeup display. Cute packaging, fun product names (Glamoflauge concealer, Welcome Matte pressed powder), and budget-friendly pricing all make it worth a second look. And if you've read all the positive reviews out there, it gets even tougher to tear myself away without buying anything! In particular, I read Rae’s review of Honeymoon, which was so glowing (haa) and convincing, I couldn't not get it. The blush is housed in fairly sturdy plastic clamshell packaging. The clear window in the top enables easy admiring of this lovely shade :B I love the purple veining, so much that I went through all the Honeymoon blushes available on the shelf and specifically picked the one with the most veining, haha. 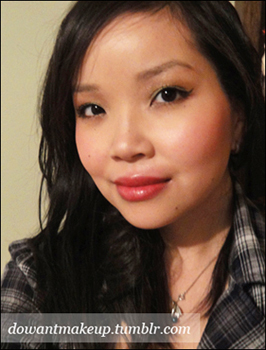 This blush is a touch pinker and brighter in person, but I think it's still wearable for both warm and cool skin tones. 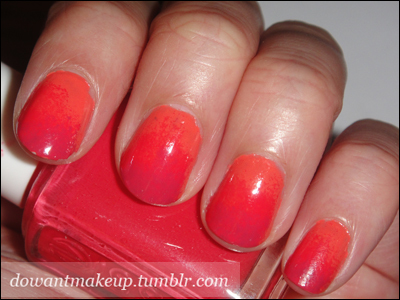 The far left might be a little hard to see, but a light application gives just a kiss of a glow. 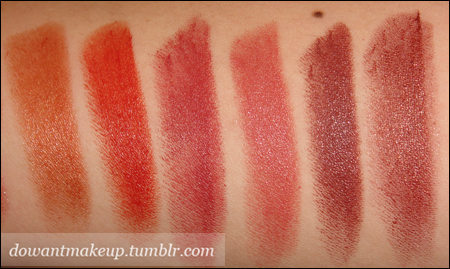 As the label says, the blush can be used wet for a more intense look. For reference, I'm NC20-25. 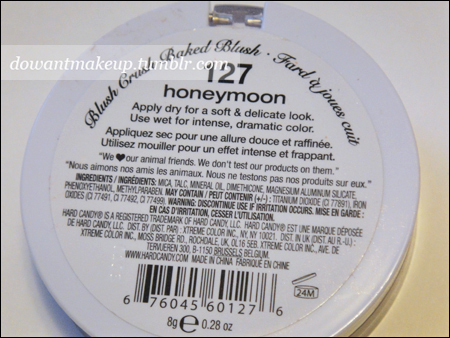 I used just Honeymoon for a very subtle glowy colour on the cheeks, but I have also used it as highlighter for the tops of the cheeks and then another blush below that. I'm careful to not to get carried away in the application while trying to build up more colour, because the fine shimmer builds up a lot faster and the look can become more shimmery than intended. 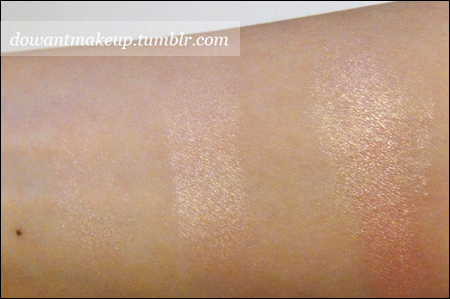 Applied with a light/moderate hand, the shimmer is not overwhelming and I have no problems wearing it to the office. Since I’m always trying to find ways to turn my makeup into multi-taskers, I’m also wearing Honeymoon on my lids and inner corners in the before and after pictures. I like how it brightens my eyes a little. 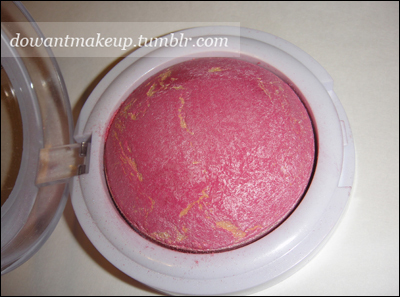 This is a really pretty, luminous blush/highlighter that will work with a lot of different skin tones. 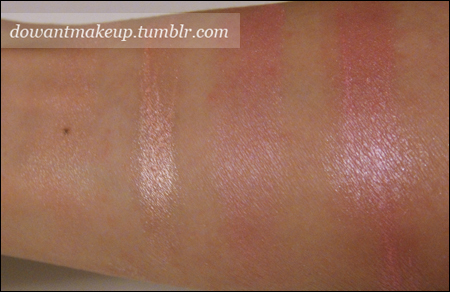 It sort of reminds me of a blush/highlighter version of MAC Gleam eyeshadow when I look at the swatches. For the price, I’m definitely happy with my purchase. I picked up this lovely over in Washington state, after the pretty turquoise bottle practically jumped at me and clawed at my wallet. These liquid liners from makeup-lover-on-a-shoestring-budget fave Wet n Wild also come in Black, Purple, Blue, Brown, and Dark Brown. I am an absolute sucker for turquoises and teals, so Turquoise was an obvious choice for me. 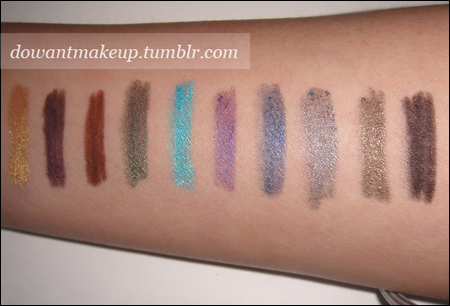 Aside from Blue, I wasn't too interested in the other shades since I already have gel liners in those colours. Easy-to-control liquid liner has a fine, flexible brush for precise application. Rich, fluid formula dries fast and stays put to subtly enhance or dramatically define. 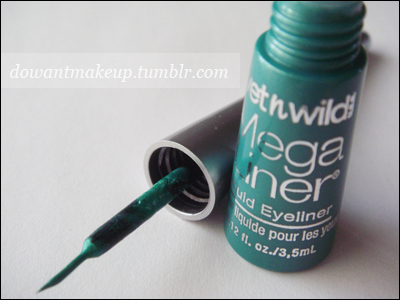 How did the product and testing hold up to Wet n Wild’s claims? For $2.99 USD, this liner has hit the mark on all counts. 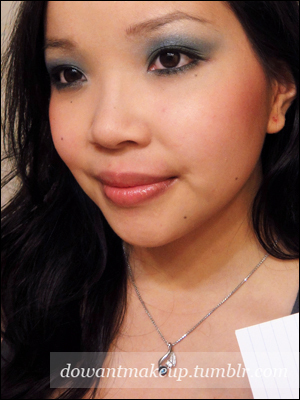 Turquoise is bright with a metallic finish and makes my eyes pop. I used to be a liquid liner pro as a teenager and worked that black Maybelline liner. I’ve probably lost most of my liquid liner powers since I discovered MAC Fluidline, but I was able to line my upper lashline and make a wing easily. The brush is very thin and indeed flexible and easy to use. A very light touch deposits a smooth line of colour. It also dries quickly: I don’t find myself needing to keep my eye closed while I frantically hand-fan it to dry (ahem). Afterwards, it stays put with no creasing, fading or smudging. I’ve fallen asleep on the couch and woken up six hours later to find my liner still perfectly in place! Despite all this, it comes off easily with cleanser and makeup remover like any regular liner. Long story short, this liner is an easy and gorgeous way make your eyes pop. Don't be surprised if you catch people staring at your eyes when you're wearing it! It's an awesome drugstore product with a ridic pricetag. A long while after buying Turquoise, I tried Blue and Purple. Sad to say, they didn't impress and are totally skippable. The pigmentation wasn't great and they weren't metallic like Turquoise. Well, at least they were cheap. 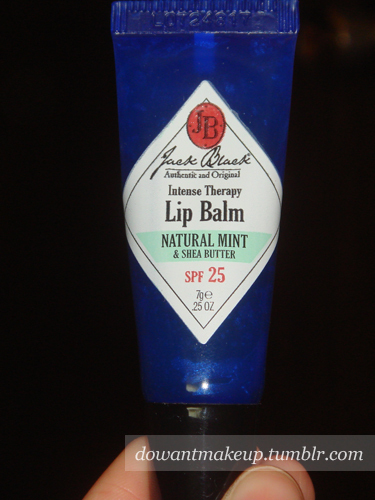 Jack Black is a line of men’s skin care products, ranging from shaving cream to hair styling to my favourite lip balm, Intense Therapy SPF 25. This review was specifically written for the Natural Mint & Shea Butter version, but other offerings include Vanilla & Lavender (!!!) and Black Tea & Blackberry. I also have Lemon & Chamomile, which I actually prefer for its sweet-but-not-too-sweet lemony scent, like some kind of delicious lemon baked good. 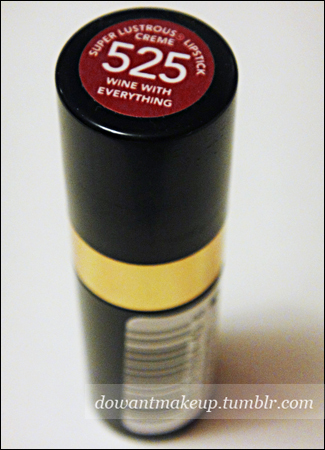 I had read tons of positive things about it, so being a lip product junkie, how could I resist? My lips are eternally dry, and since it is a product marketed toward men, I was expecting some no-frills moisturizing that wouldn’t irritate the eczema around my mouth. 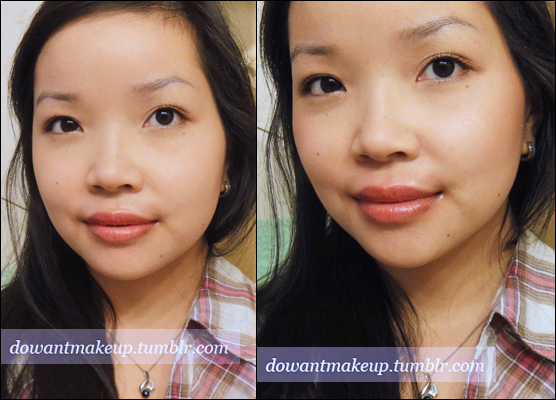 It definitely did the trick without feeling thick or heavy, and has only a very subtle shine. To me there are two types of lip balms: the ones that maintain your lips' already-good condition, and the ones that really moisturize when your lips look like they are competing with the Sahara desert. Jack Black Intense Therapy is definitely the latter; this is absolutely the one I turn to when my lips are desperately in need of moisturizing and softening. I have recommended this balm several times to both male and female friends and they always love it. Some people have compared this product to Carmex tube balm, but I feel that Intense Therapy is definitely superior. I prefer the slanted tip applicator on Intense Therapy to the rounded applicator on Carmex, as well as the lighter texture compared to the heavier feel that the Carmex balm has on my lips. Lastly, the cherry Carmex I bought has a heavy, synthetic scent that I'm not too fond of. All in all, it’s a great product. Bonus: the man-friendly packaging means the men in your life (boyfriend, guy friends, dad) won't be too shy to borrow it for their own chapped lips. Sharing is caring! 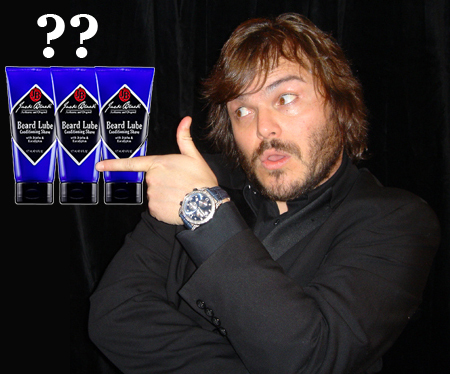 Check out the retailer locator at the Jack Black website to find other stores that carry Jack Black products.